The 14-by 24-foot Marshall House Flag is being exhibited in South Hall through Feb. 24, 2013 in conjunction with the nearby 7,000-square foot exhibition on the Civil War. An Irrepressible Conflict: The Empire State in the Civil War is open through September 22, 2013 in Exhibition Hall. James Jackson hoisted the Confederate national flag onto a 40-foot-tall flagpole atop his hotel, the Marshall House, in Alexandria, Va. shortly after the Confederates bombarded Fort Sumter, S.C. in April 1861. The flag was so large that it was visible from the White House. Federal forces, including Col. Elmer Ellsworth and the 11th New York Volunteers, crossed the Potomac and entered Alexandria on May 24, 1861. The 24-year-old Ellsworth, formerly of Malta, decided to remove Jackson’s flag from the Marshall House. With a small party, including Corp. Francis Brownell of Troy, Colonel Ellsworth climbed to the roof and cut down the flag. During their descent Ellsworth and his party encountered Jackson, who was armed with a shotgun. Gunfire ensued, leaving both Jackson and the charismatic Ellsworth dead. The Marshall House incident became national news and plunged the entire country into mourning – the North for Ellsworth, the South for Jackson. President Abraham Lincoln ordered an honor guard to deliver Ellsworth’s body to the White House for a funeral service. Ellsworth had worked in Lincoln’s law office in Illinois when he moved there from his childhood home in Malta. He became a tireless Lincoln supporter during the election of 1860 and accompanied him to Washington. When war broke out, Ellsworth returned to New York State to raise a regiment. Following the White House funeral, Ellsworth’s body laid in state at City Hall in New York City and at the State Capitol in Albany, respectively, before being buried in Mechanicville. The Marshall House flag accompanied Ellsworth’s body home to New York state. Relics connected to Ellsworth’s death became prized possessions, including pieces cut, or “souvenired,” from the Marshall House flag. In the collections of the New York State Military Museum, the flag was conserved at the New York State Office of Parks, Recreation and Historic Preservation’s textile laboratory at Peebles Island in Waterford. As part of the New York State Battle Flag Preservation Project, the preservation and display of the Marshall House Flag was made possible with generous support from the Coby Foundation. 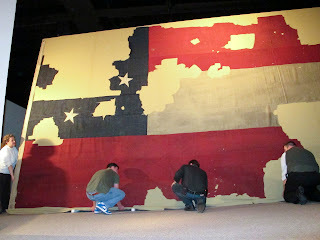 Photo: The Marshall House Flag being installed at the New York State Museum (provided).